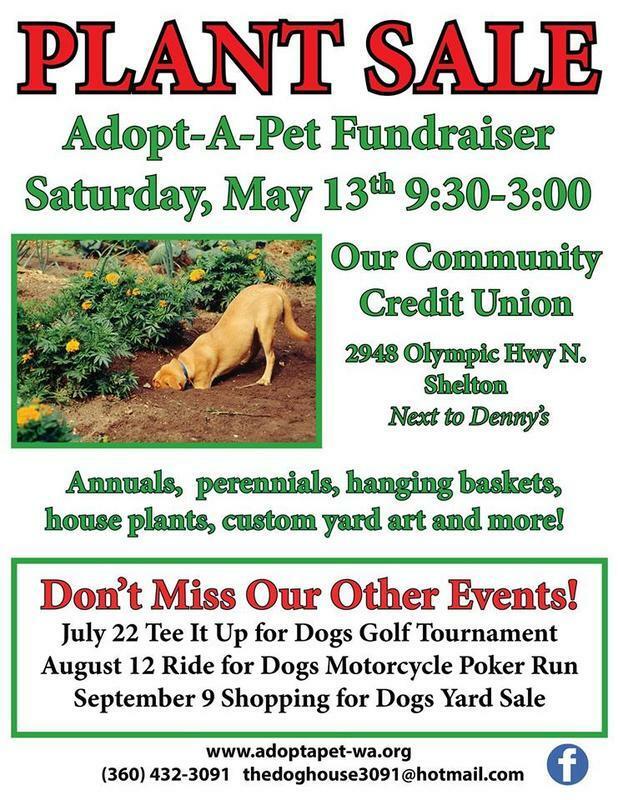 The weekend of May 6 marks the first of a series of four area plant sales with proceeds dedicated to local organizations that spay and neuter pets and provide adoption services for pets. This is a terrific opportunity to acquire perennials, beautiful dahlias, herbs, some vegetables, or to choose from a large variety of unusual plants at great prices. 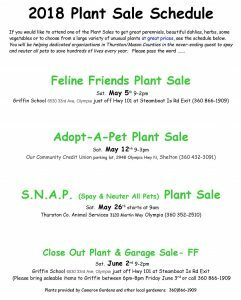 And, that fourth sale is both a plant sale and a garage sale, where you are invited to donate gently-used, saleable items, to benefit Feline Friends. All these sales will happen, rain or shine! And 100% of proceeds benefit homeless pets. Many thanks to Diane Jacob, at Cameron Gardens, and other local gardeners, for providing the plants and staffing these four sales. There will be an outstanding variety of flowering perennials and some annuals as well as some dahlia tubers. Call (360) 866-1909 for more information. Just in time for Mother’s Day. There will be large hanging fuchsia baskets as well as many green house raised annuals. Call (360) 432-3091 for more information. There will be many plant choices to check out here including wonderful donations from Briggs Nursery as well as different local gardeners. Call (360) 352-2510 for more information. Do you have saleable items to contribute? Please bring them to Griffin between 6pm-8pm Friday, June 3rd or call (360) 866-1909. Your support will be helping dedicated organizations in Thurston and Mason Counties in the never-ending quest to spay and neuter all pets to save hundreds of lives every year. This Saturday sees the return of two holiday events to the Griffin/Steamboat Peninsula area. 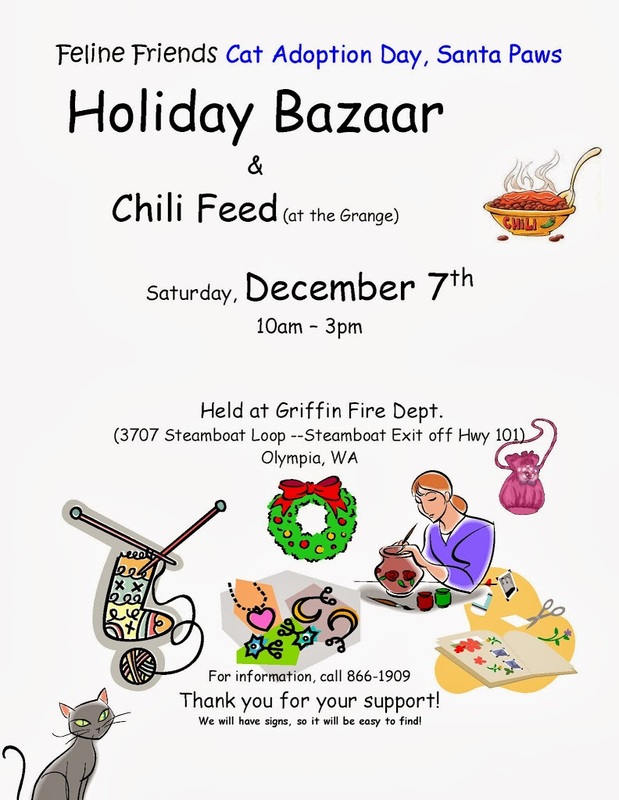 One is the Feline Friends Cat Adoption Day, Santa, and Holiday Bazaar. 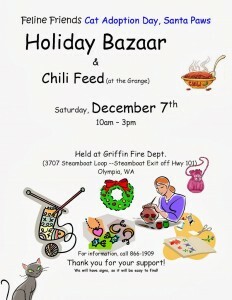 The other is the Griffin Holiday Market. Between these two events, you’re bound to find a lot of goodies you want for this season’s gift-giving. Santa will be available at the Feline Friends Holiday Bazaar to have photos taken with your pets (on a leash only) or children. Stop by to visit with friends and neighbors and to shop for those extra special gifts made by local artisans and have some Hot Apple Cider. Check out their Raffle and Bake Sale with lots of cookies. Of course, the Feline Friends Cat House will be open with cats hoping to find a loving forever home before the New Year. 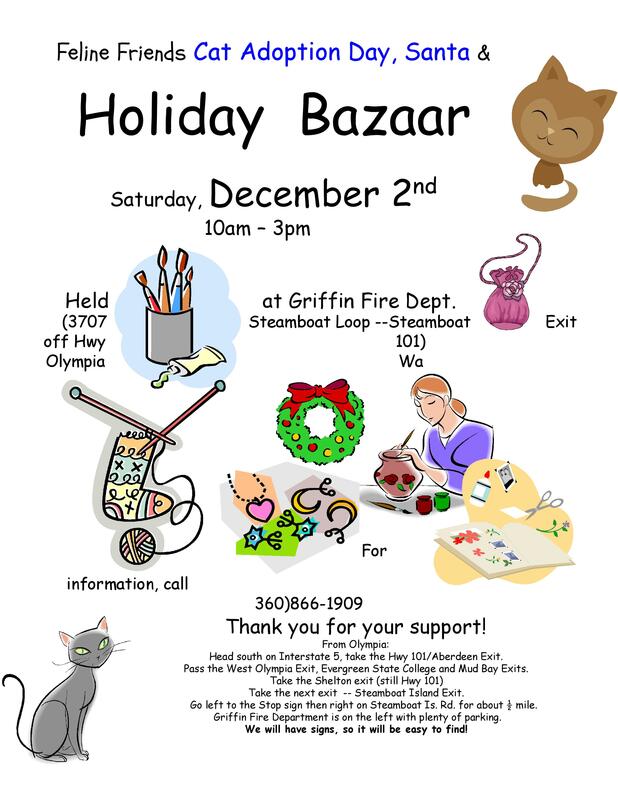 On the same day, the Griffin School invites you to come peruse their Griffin Holiday Market. More 30 vendors are featured, with the focus on vendors selling homemade items. There will be a great variety at this event, which is a fundraiser to support the Griffin Middle School band’s Disney trip in April. There will also be a bake sale, silent auction, and performances by individual band students. We hope to see you shopping locally at both these holiday events, this Saturday. 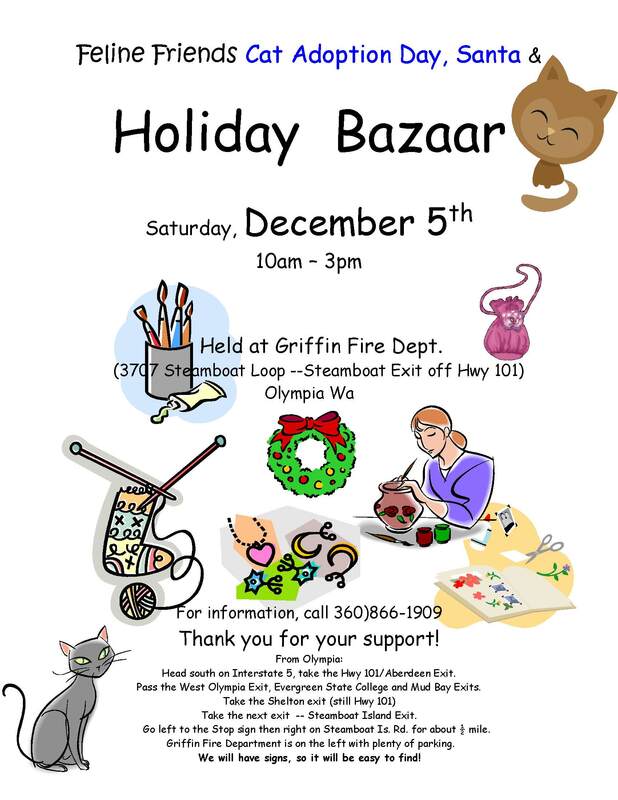 The annual Feline Friends Holiday Bazaar will be Saturday, December 5th at Griffin Fire Station from 10am – 3pm. Many of the crafters/artists are from the local area featuring handmade wreaths and Christmas decorations; beautiful gifts for people, pets, gardens and birds; homemade jams, jellies, and seasonings; beautiful jewelry and woodwork to list just a few items. There will also be a raffle and bake sale with goodies donated by friends and neighbors. Santa will be available for pictures with pets (on leashes only) and children. The coffee is on, so stop by for fun and good cheer. The Cat House (6515 Sexton Drive NW) will be open for viewing and adoptions. Many kitties would love to begin the holidays with a forever home and there are so many to choose from. For more information about Feline Friends, click here. Feline Friends will hold a Cat Adoption Day and Holiday Bazaar at the Griffin Fire Department Headquarters, 10 AM to 3 PM on Saturday, December 6. 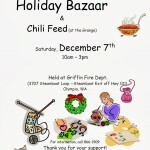 This is an annual bazaar with over 20 tables filled with great gift ideas for the season. Santa will be available for pictures! Crafts include hand blown glass art, Christmas wreaths and decorations, handmade soap, jams and jellies, candles and many other unique items. There will also be a bake sale. Join us for fun and to support this special cause. 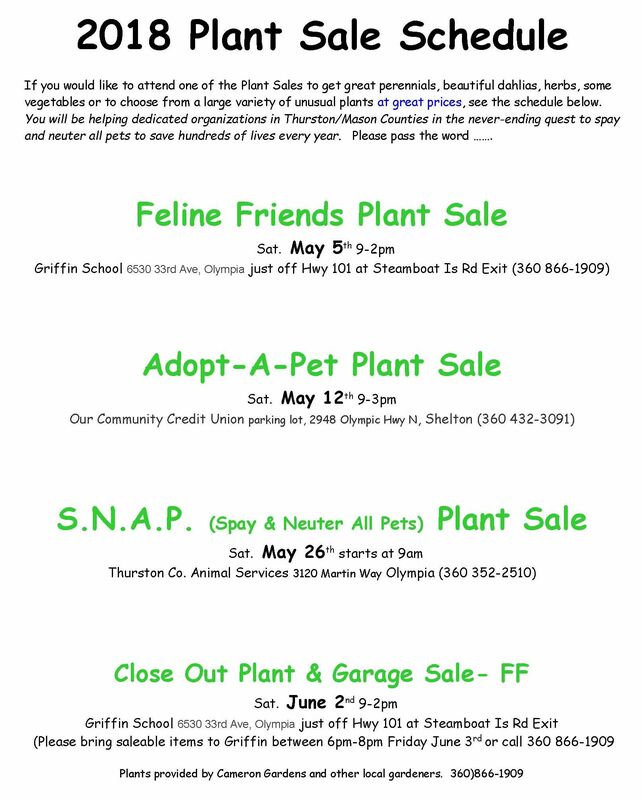 The huge, annual Feline Friends Plant Sale will be this Saturday, May 5th, at Griffin School. Once again a number of you have volunteered your Saturdays in April and helped Dig & Pot many different perennials and divided dahlias for the sale that benefits our own neighborhood “cat house”. Rain or shine, the sale starts at 9am and ends at 3pm. Many plants for hummingbird and butterfly gardening, as well as great cut flowers (the same you see in the summer bouquets at Island Market), tomatoes, fuchsias, petunias and marigolds are ready to grace your garden. 100% of the proceeds benefit Feline Friends, and it couldn’t be done without your support. 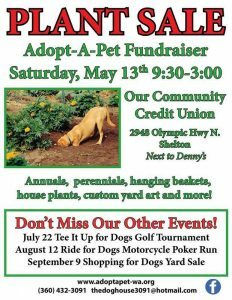 If you can’t make it this Saturday, but would like to attend one of the other animal rescue Plant Sales that Cameron Gardens supports in Mason and Thurston Counties, please email me for a schedule. Feline Friends Cat House will be open Saturday for Cat Adoption. Stop by or visit the website to find a new furry friend. Thank you for your support! 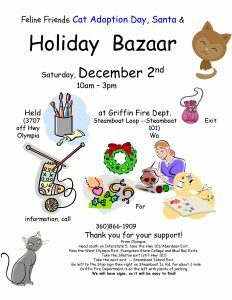 The 2010 Feline Friends Holiday Bazaar and Cat Adoption Day is this Saturday, December 4, from 10am to 3pm at Griffin Fire Department. There will be over 25 tables filled with a variety of gifts and crafts and baked goods (feel free to stop by and bring your favorite). Hot Apple Cider and Delicious baked goods, Pet Toys and Snuggle Beds, Handmade Milk Soaps and Candles, hand crafted Jewelry, Orgami gift tags/bags/cards, beaded Christmas trees, Centerpieces, Metal Art, Garden & Yard Art, Cameron Garden Seeds, a White Elephant table and Raffle, and much more too unique and too good to miss! Of course, the kitties are the real winners. Pass this along to all your animal loving friends. CAT ADOPTION DAY (follow signs) will be at the Cat House behind the Steamboat Animal Hospital at the same time as the Bazaar! Some of these furry friends have been waiting since summer for their new forever owner to come for them. Jo and some of her volunteer will be there to make sure a purrfect match is made. Happy Holiday from Feline Friends!